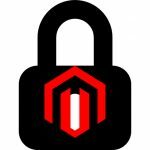 PagSeguro for Magento 2 provides ecommerce sites with secure payment experience to ensure maximum consumer safety. All payment transactions are processed on secure PagSeguro servers, so merchants do not have to worry about getting their own SSL certificate and PCI compliance responsibilities. Out-of-the-box PagSeguro extension for Magento 2 includes all necessary features for accepting and managing online payments using PagSeguro payment integration. PagSeguro module is compatible with most third-party payment gateways for Magento 2. PagSeguro supports major credit and debit cards, including Visa, MasterCard, American Express, Visa Debit, Diners Club International, Pleno Card, Banrisul, ValeCard, Bradesco, Elo, Boleto, Cabal, Itau, Sorocred, Amex, Hipercard, Aura, Personal Card, BrasilCard, FortBrasil, Cardban. An extensive choice of payment options attracts more customers and lets them pay with their preferred card. Customers can pay online from any device quickly and safely. 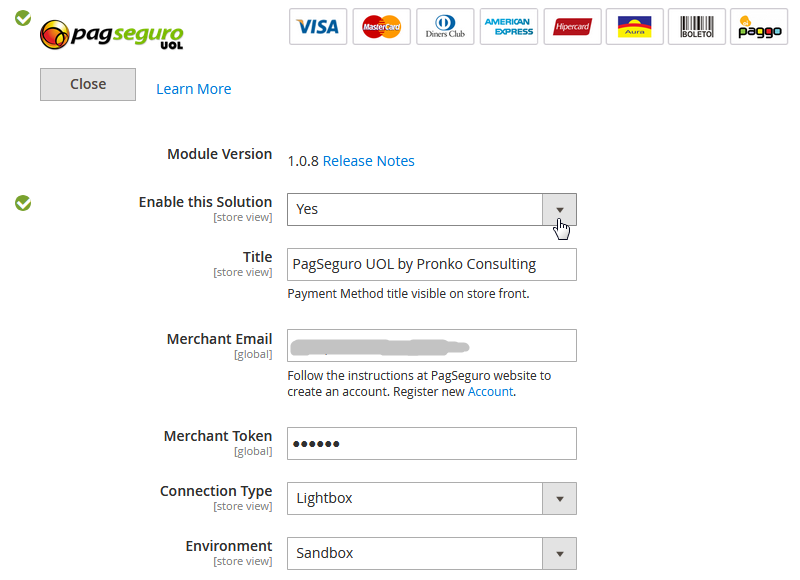 PagSeguro provides merchants with two types of checkout experience, either a lightbox popup or redirect to the PagSeguro server. In both options all payment transactions are processed by the PagSeguro server, so merchants do not have to worry about their PCI DSS compliance. Integration for Magento 2 uses PagSeguro Payment API (PCI SAQ A) with redirect or lightbox support. Payment form can be configured as a built-in lightbox popup, opening in an iFrame on the payment page of your web store. The embedded form provides customers with seamless user experience, while the transaction is processed in the secure PagSeguro payment environment. After payment processing is finalised, customers receive payment confirmation from your store. Redirect payment type provides online stores with even more secure experience. After placing an order, a customer is redirected to a fully secure PagSeguro payment page to complete the payment. 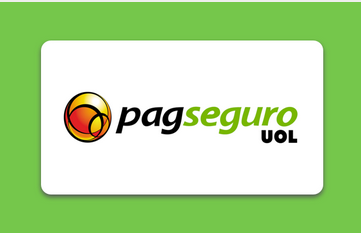 PagSeguro module provides a simple and easy way to accept online payments via mobile, tablet and desktop devices. The module supports multiple stores and multiple accounts on one website. 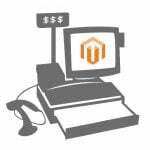 Payment details are available on the Order View page from the Magento Admin. PagSeguro extension brings merchants flexibility in controlling transaction status after an order is placed. The module supports Refund and Cancel operations. The PagSeguro module supports receiving notifications from the PagSeguro Payment provider, decreasing manual actions done by the admin users. Transaction and notification integration lets users have a seamless experience for all transactions processed in an online store. The module comes with a robust set of configuration settings. A user can easily configure PagSeguro integration according to their needs without any technical skills required. PagSeguro module development team is continuously releasing new features and updates of the module to provide users with the best experience of payment processing. After you install PagSeguro module on your store, it will be visible to your website visitors as a payment method along with other available payment options when they proceed to checkout. The payment page can be displayed in two ways on the frontend, depending on which connection type a store admin chooses in the module’s configuration settings. One option is a redirect integration type. With this connection type, customers will be redirected to the PagSeguro provider’s payment page, where they should enter their credit card details. After completing a purchase on that page, a customer will be redirected back to the order success page on your store. PagSeguro payment page is completely PCI compliant, providing customers with a safe way of placing their orders without saving any sensitive data of their credit cards. Another module integration type you can choose is a lightbox. With this option, a popup window will be embedded in your store. Customers can fill their credit cards information without leaving the checkout page on your store. In this case, sensitive card data is also not stored on your server, but processed in the PagSeguro secure environment. After a customer completes the payment, they receive an order success confirmation from your store. 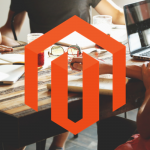 The PagSeguro plugin for Magento 2 provides users with a flexible and easy-to-use solution with no technical skills required for setting up the module. The first thing you need to do before starting to configure the module for your web store is to acquire an account from PagSeguro by registering as a vendor on PagSeguro website. After you register, you will get a Merchant ID and Token that you will need to enter when configuring the module settings. To go to the Configuration interface of the module, navigate to Stores → Settings → Configuration, and select Sales → Payment Methods in the left-side menu of the page. When installed, PagSeguro will be listed in the Other Payment Methods section. By clicking “Configure”, you will open all the extension’s configuration settings. After you finish with the module configuration, you can close the settings tab by clicking “Close”. First, choose Yes in “Enable this Solution” to allow PagSeguro as a payment method on the checkout page of your website. “Title” defines the name of the PagSeguro payment method how it will be visible to customers at checkout. In the “Merchant Email”, you should insert the Merchant ID that you get from the PagSeguro payment provider. “Merchant Token” value is also provided by PagSeguro when you register your account with them. Choosing one of the “Connection Type” options, you decide how the payment page is integrated into your website, whether as Redirect, or Lightbox. If you select Redirect option, customers will be redirected to the server hosted by the PagSeguro provider to make a payment. 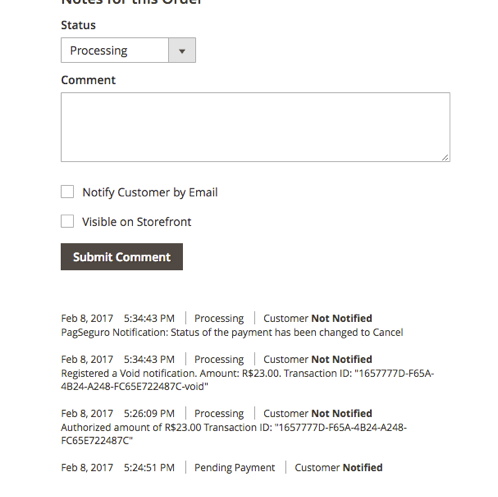 When choosing Lightbox option, a popup window with a payment form will open after a customer clicks on the “Place Order” button. “Environment” type changes the state of the extension from staging (“Sandbox”) to production (“Production”). It is recommended to use “Production” setting once the website is live. When you choose Yes in the “Debug” field, it will make all communication queries stored in the pagseguro.log file. The module allows choosing preferred “Shipping Type” from the available options, which are Normal Order (PAC) or SEDEX. You can also select Not Specified in this field. In the “Minimum Order Total” you can specify the value for the amount that should be reached to display PagSeguro payment method at checkout. As for the “Maximum Order Total”, you can specify the value to show PagSeguro as a payment option only in case a maximum order total is less than the specified number. 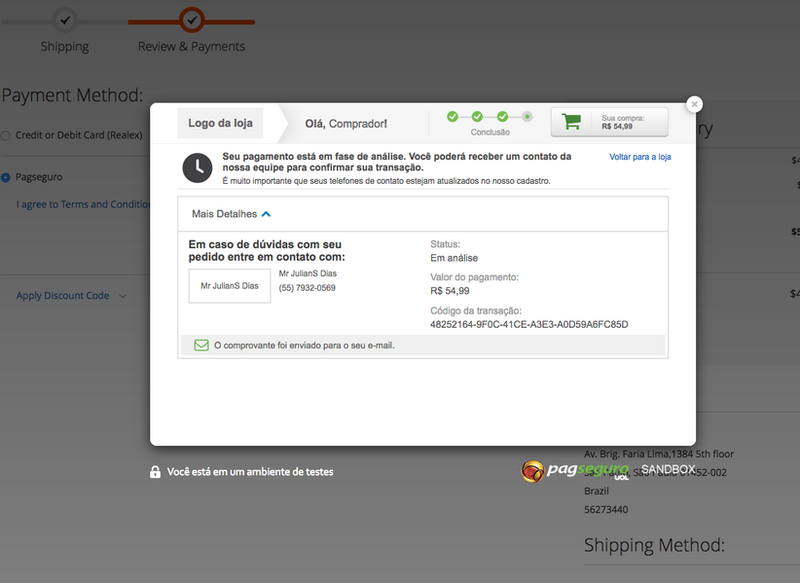 “Sort Order” shows PagSeguro payment on the checkout page according to the number entered here. 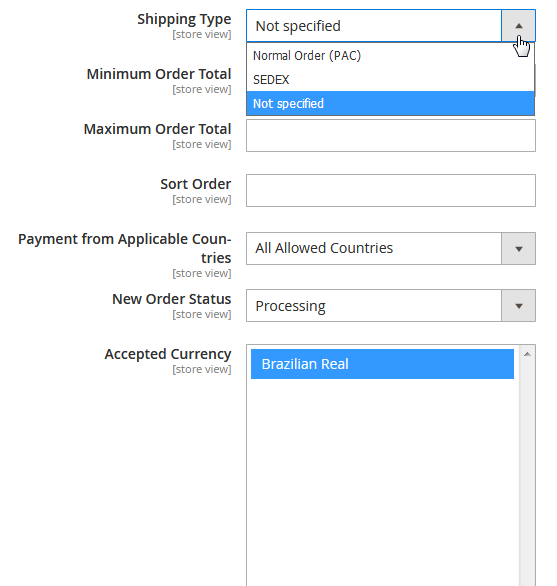 “Payment from Applicable Countries” setting defines whether PagSeguro payment method will be displayed if a shipping or billing country from the allowed list is selected. 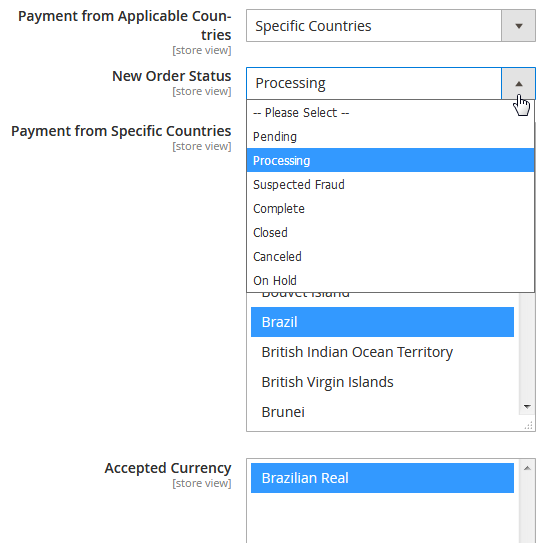 If you choose “Specific Countries”, you can specify which countries you would like to accept payments from in a drop-down menu. “Accepted Currency” allows selecting the currencies in which you would like to get payments. Currently only Brazilian Real is available as an accepted currency. You can change “New Order Status” if the status assigned to existing order was deleted or unassigned in the Stores → Order Status configuration. Next to the Module Version number, you will see a “Release Notes” link. If you click on the link, it will open the list of all plugin updates in the new window. The PagSeguro module comes with the transaction notifications support. It means, that when the PagSeguro payment provider sends notifications about the change in transaction status to your website, capture invoice is created automatically. On the Order View page, Magento admins can view all details on payment transaction data processed with the PagSeguro payment method. Payment details include transaction refund, void and capture operations, that are available to a user via the admin panel. You can view all communications between your store and PagSeguro payment provider in the support report generated during PagSeguro lifecycle. All communications are stored in the pagseguro.log file, which is used for validation and testing of the PagSeguro module. The pagseguro.log file is usually located under var/log/ directory in the Magento application. You can purchase the extension for the price of $199 as a one-time payment. The extension package includes installation service, one-year free customer support, as well as English and Portuguese language packages. With the purchase, you also get free plugin updates and bug fixes for one year and a money-back guarantee for 30 days.